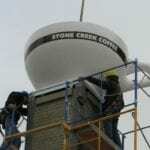 Stone Creek Coffee made a huge statement in downtown Milwaukee with the installation of their new giant coffee cup. 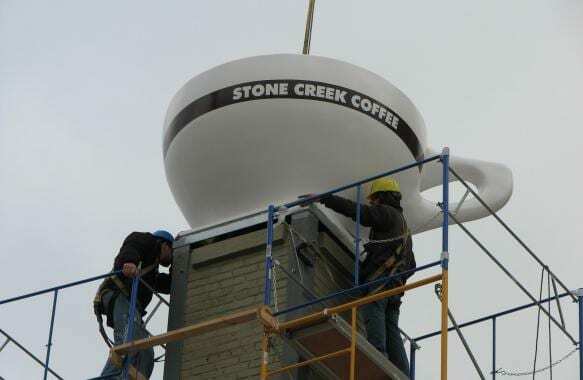 This coffee roaster and retailer came to us with their vision for a huge coffee cup on top of their new location, which is just below Highway 794 on 5th Street. 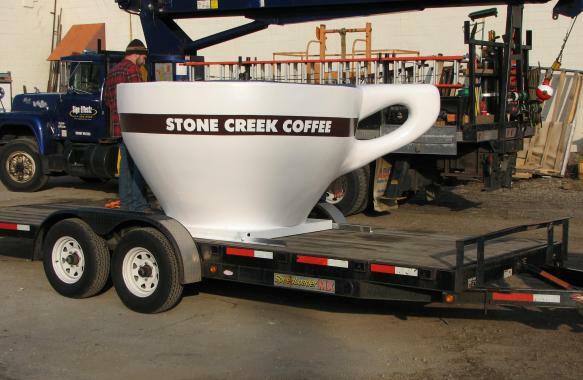 The coffee cup, which is more a sculpture than a sign, began catching the attention of motorists in November, 2012. Preliminary problem-solving enabled the client to validate its one-of-a-kind concept. It challenged us to figure out how to construct the cup and select the right materials. 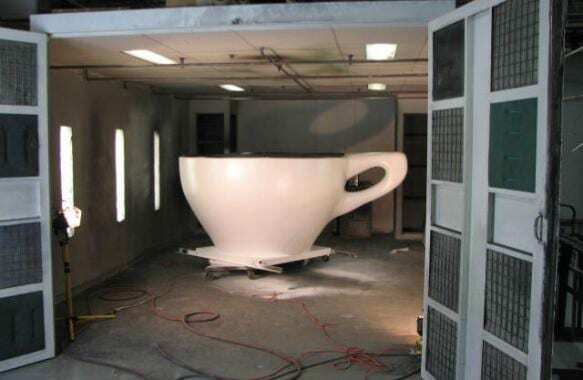 We developed a CAD model and determined that the cup would have aluminum ribs, rotated around an aluminum tube spine. Additional aluminum strip stringers were added for a stable aluminum sub structure. With important questions about the client’s concept addressed, we were in a position to deliver an estimate to them. 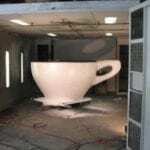 When it comes to good estimating, you have to do a certain level of product development. Educated guesses regarding the final product are common. 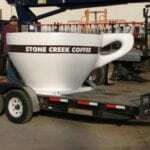 With their agreement on the estimate, we began refining the final design. The design of the composite skin was simple: it is similar to the hull of a boat, which consists of structural fibers laminated together with a bonding resin. Because of the versatility of fiber selections, we could make it as strong as needed. There is a wide range of materials when it comes to structural fibers and bonding resins. The mixture of the two, as well as the layup method used, gave us the level of structural stability required. It also impacts the cost as there is a direct proportion between strength and cost. We elected to go with Fibre Glast.